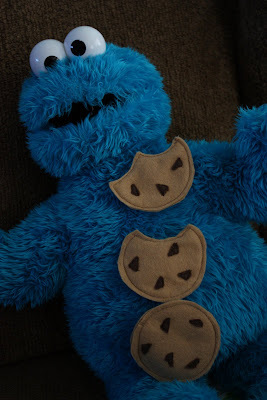 Cookie was a very happy monster. He’s been living here over two years and finally, he has some cookies of his own. These felt cookies upped the monster’s play value considerably. 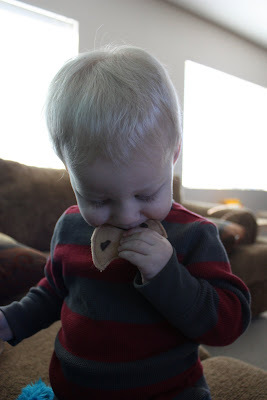 He’s always been loved, but he’s so much more agreeable when there are cookies for him to eat. Enzo likes stuffing the cookies in his mouth the best. Zizza prefers to help him chomp. Nice Snow White tattoo huh? 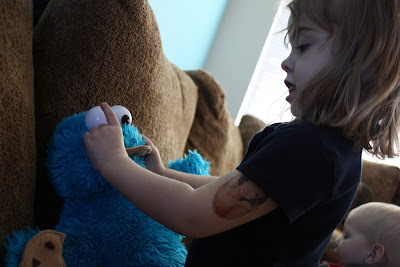 That thing has been firmly affixed to her arm for over a week, it’s not even starting to peel. I don’t think stick-on tattoos lasted that long when I was a kid. Back to the topic at hand, it was only a matter of time before someone got curious. I’ll bet that felt has a good mouth feel. I think making those cookies was the best half hour I’ve spent all week. 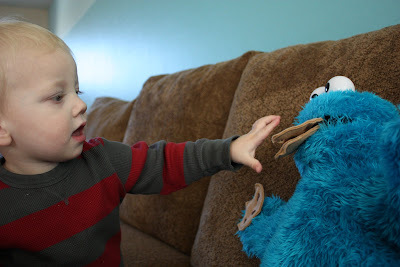 Those are so cute, I love that little addition to the monster, he isn’t quite the cookie monster without some cookies.